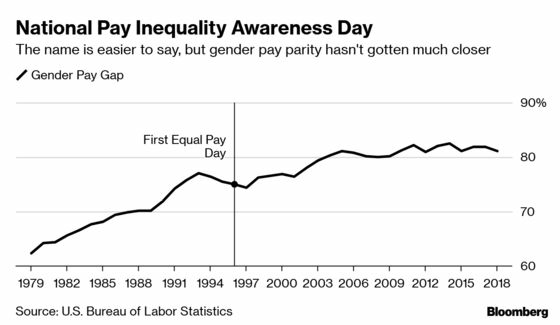 (Bloomberg) -- Women in the U.S. earn on average 81 percent of what men do, a fact commemorated Tuesday by what’s come to be called “Equal Pay Day” -- the day to which a woman has to work to earn as much as a man did in the previous year. And while a lot has changed in the 23 years since the National Committee on Pay Equity noted the date for the first time, one big thing hasn’t: The gender pay gap, as it’s called, has barely budged. In 1996, the year the National Committee on Pay Equity first established “National Pay Inequality Awareness Day,” women in the U.S. earned 75 percent of what men did. The ratio cracked 80 percent in 2004 and has been basically flat since, according to the U.S. Bureau of Labor Statistics. The name was changed to Equal Pay Day in 1998 to make it less of a mouthful, she said. It was also moved earlier in April to correct for a math error. The group picked Tuesday, which to signify how far into the next week a woman has to work to match a man’s pay the previous week. The group also tries to avoid holidays and days when Congress isn’t in session. In spite of the sluggish pace of progress, Leber says she’s hopeful. California and Massachusetts now have passed laws that ban questions on salary history in the hiring process, in an effort to level the playing field. Congressional Democrats passed the Paycheck Fairness Act last month, and initiatives at the local and regional level may also help push change, she said.